Yesterday spring came a little early. It was like the forward guard of the season, the initial advance, the pilot showing the way for the warm, upcoming days. 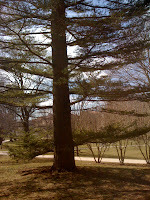 I sat in the park for awhile, next to this self-assertive tree, while many families enjoyed the park in this trial-run of spring.